This week we get rolling with our series of summarizing the Scripture with the purpose of helping us to shrink the Bible into one big picture, so to speak, in order to connect some dots and how the Word is primarily a picture of Jesus Christ. 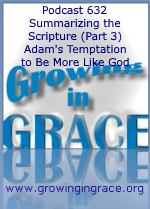 Adam’s temptation revolved around the desire to be wise and more like God. The serpent challenged him on the basis of identity, much like the devil did with Jesus in the wilderness. One chose not to believe God and failed (Adam). The other chose to believe the truth and overcame (Jesus). We are challenged in a similar way today when it comes to our identity in Christ.